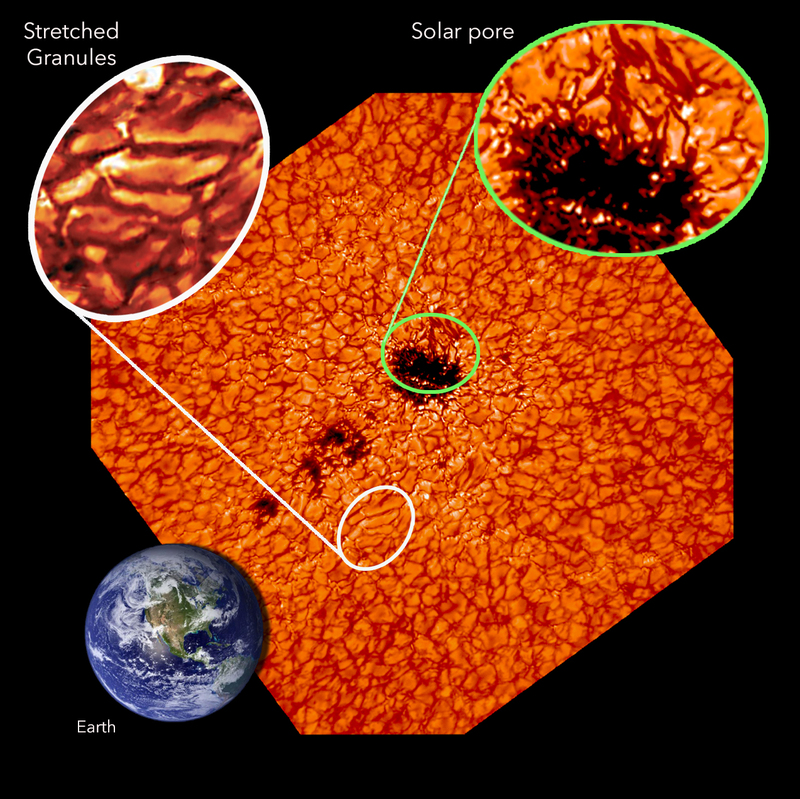 Solar activity entails numerous processes occurring in the star nearest to Earth. These processes have far-reaching effects, generating “space weather” that brings bursts of charged particles and high-energy radiation in the direction of Earth at nearly the speed of light. 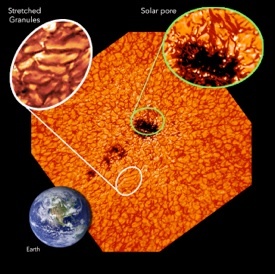 The magnetic field generated in the solar interior and brought to the surface creates a wide variety of structures, with sunspots being the most well-known. Sunspots can cover large areas of the surface of the Sun — up to several times the size of Earth. They can persist for weeks or even months before vanishing. Associated with the evolution of sunspots, solar flares and coronal mass ejections are especially intense during the solar maximum, the period of greatest activity in the 11-year solar cycle. Multiple phenomena can also occur on “smaller” spatial scales of several thousand miles, and in a matter of minutes. Believed to be driven by the interaction of magnetic fields, these events occur with greater frequency and appear to be directly responsible for continuous heating of the solar atmosphere. High-definition images of the Sun´s surface (left) and lower chromosphere (right) observed with the New Solar Telescope. This region of the Sun displays a some dark structures (solar pores) and the convective pattern (granulation) in which they are immersed. The region in the white circle is zoomed-out to show the action of the magnetic flux rope that interacts with the plasma and deforms the shape of the granules. At the lower part in the right image the scientists detected the ejection of a plasma surge extending thousands of miles. A series of images acquired in the course of this work recorded the evolution of the solar surface and atmosphere at 15-second intervals with a spatial resolution of approximately 40 miles per pixel. The researchers discovered that the solar surges can be triggered by buoyant magnetic-flux ropes that emerge briefly on the surface and interact with ambient magnetic fields. 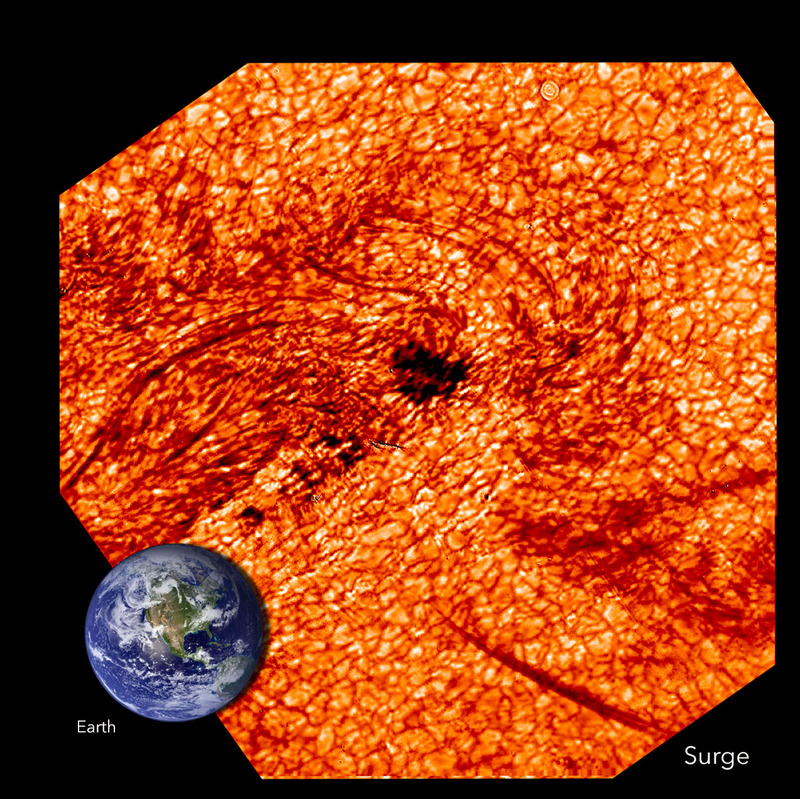 The 6,000-mile magnetic-flux rope observed rose up from the solar interior, stretched the granulation patterns and traversed the surface of the Sun, which is dominated by convective motion. The pattern of convective cells seen, known as granulation, consists of granules analogous to bubbles in boiling water. In the Sun, convection takes place in plasma at a temperature of 10,000 degrees Fahrenheit. At any given time, the Sun´s surface is covered by about four million granules. The area covered by just a few of these granules is as large as the continental United States. When a magnetic rope interacts with the granulation, it deforms the cells and they increase to some five times their original size. And as they rise, newly emergent magnetic fields hit pre-existing ambient fields. The NJIT researchers discovered that an effect of this interaction, known as reconnection, is localized heating on the order of hundreds of thousands of degrees and the production of a surge in which plasma is rapidly accelerated to a speed of 70 thousand miles per hour within 10 minutes. Cartoon illustrating the action of a six-thousand miles long magnetic flux rope rising up from the solar interior and stretching the granules. The interaction between the emerged and the ambient magnetic fields produces impulsive heating and an ejection of a plasma surge. 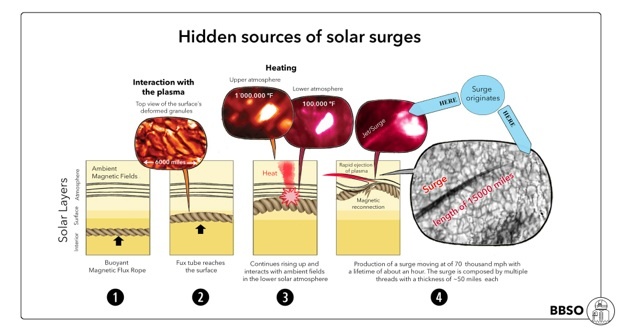 This research has shown that the complex action of small-scale and “hidden” fields on the Sun is important for understanding how energy is transported to the solar atmosphere. The process investigated can play a significant role in mass and energy flow from the Sun’s interior to the corona, the solar wind and Earth’s near-space environment. Funding for this research has been provided by AFORS, NASA, NSF and NJIT.